With the deadline for a final redistricting map fast approaching, the latest draft of District 6 looks familiar, with two notable exceptions. South of Market and the Tenderloin are almost completely intact and Treasure Island is still part of the district. 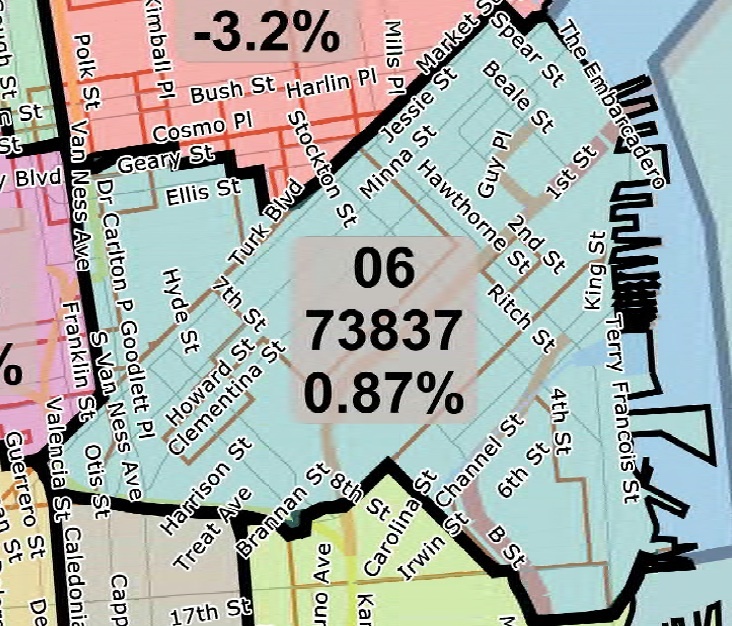 But the portion of Hayes Valley and the North Mission that were part of this district for the last ten years are now included in Districts 5 and 9 respectively. Every ten years, the Federal Government conducts a census to determine the number of individuals living in the United States. After the census is completed, the Charter requires the Director of Elections to determine whether the existing Supervisorial districts meet the legal requirements established by federal, state and local law. If the existing districts no longer comply with these legal requirements, the Charter requires the Board of Supervisors to convene a Redistricting Task Force to redraw the boundaries. The last scheduled meeting of the Redistricting Task Force is on Saturday, April 14, at 10 a.m. in room 400 of City Hall. The Redistricting Task Force must present a final plan outlining the new Supervisorial district lines to the Board of Supervisors by April 15, 2012.